There is a bright future for facilities management (FM) in Saudi Arabia, which represents 55 per cent of the entire FM market in the GCC, and will grow further to be worth a whopping $29.1 billion by 2017, according to research released by two authorities in the sector. 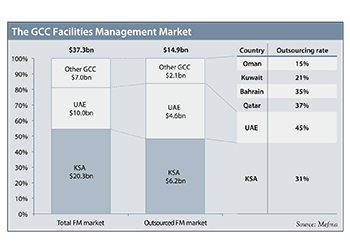 The FM market in Saudi Arabia is currently worth $20.1 billion, says the report released by leading advisory services firm Credo and Middle East Facility Management Association (Mefma). It has subsequently forecast its growth based on new infrastructure projects coming online and charting the consequences of a government initiative launched to improve the standards of FM. Growing at 13 per cent year on year will make Saudi Arabia the largest FM market in the Middle East, says the report. “Trends in both private and public sectors suggest that it is poised to realise a higher potential and shed its historic low-cost, low-quality image,” says Alistair Stranack, partner and head of Credo Middle East. The report also examines the challenges the sector faces during its development. Cost-driven customers – where contracts are awarded to the lowest priced contractors – is the biggest hurdle since it creates a false economy and detracts from the value that FM can add to a buildings life cycle. Talent acquisition and training were also cited as barriers holding back industry development, as was a lack of regulation. However, Mohammed AlDuraibi, the CEO of Da’em Real Estate Investment Company and a Mefma board member, says this will change. The report also breaks down development by sector, with real estate and healthcare to experience the highest growth rates to 2017 of 20 per cent and 17 per cent, respectively. Industrials will also benefit from continued efforts to diversify the economy away from oil and gas. Mefma is the dedicated platform for the facility management industry, wider construction industry stakeholders and owner associations in the GCC. It is supported by the UAE’s Real Estate Regulatory Agency (Rera) as a non-profit association. Meanwhile, another report which has focused on the entire Middle East, sees a positive outlook for the FM sector in terms of expectations for growth in business turnover and opportunity for future training and qualifications. Key findings in ‘The Middle East FM Business Confidence Monitor’ white paper indicate confidence among FM employees of a pay rise and expansion in workforce. Almost 51 per cent are confident of an increase in salary in the next 12 months, whilst 61 per cent believe that their workforce will increase during the same period. The study also reveals key opportunities for alert organisations, including introduction of training and professional qualifications. This will enable FM companies to meet the demand for professional workforce and, at the same time, help to address business challenges of recruiting and training staff. The white paper was commissioned by the British Institute of Facilities Management (BIFM), in association with FM Expo, the largest facilities management event in the Middle East which was held in Dubai in May (18 to 20), and ifm.net, the news and information service. Jaafar Shubber, senior project manager, FM Expo says the report shows a high confidence in the region’s FM services, where 41 per cent are positive about the current FM business environment and 57 per cent believe their FM budget will increase over the next year. FM Expo was held at the Dubai World Trade Centre concurrently with Commercial Cleaning and Hygiene, Middle East Waste and Recycling, and Elevators and Access Control expos. It was supported by principal intelligence partner Imdaad; innovation sponsor Emrill; sustainability sponsor Farnek; The Smart FM – ETA Facilities Management; Mefma; and BIFM; and endorsed by Dubai Municipality.